Lavender organic, non-biological and concentrated Laundry Liquid can be used in hot or cool water and mixes instantly. Suitable for sensitive skin and Allergy UK Certified, it is perfect for fine and delicate fabrics. Safe for septic tanks and cess pits, readily biodegradable and featuring recycled and recyclable packaging. Cruelty Free International and contains no optical brighteners. There are currently no questions to display about Bio D Concentrated Non-Bio Laundry Liquid - Lavender - 1L - 25 Washes. Bio-D cleaning products are 'biodegradable', capable of being decomposed naturally by living matter. 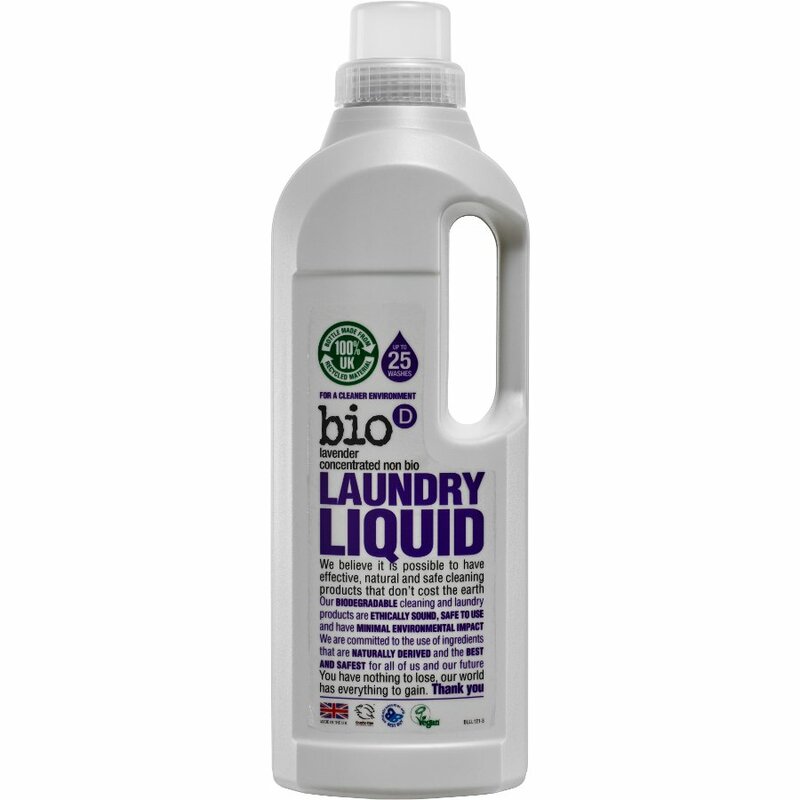 Bio-D is a UK based independent, family-owned, ethically motivated company, dedicated to promoting the use of hypoallergenic, environmentally responsible detergents. Using plant-derived raw materials obtained from renewable sources ensures a minimum impact on the ecosystem both in the use and in the manufacturing process of these eco-friendly cleaning products. Bio-D operates a strict policy whereby none of their raw materials or finished products are tested on animals and have a fixed cut-off date of 1988. All raw materials are free from genetically modified ingredients and animal by-products. The company is subject to scrutiny and approval by The Vegan Society, Naturewatch Trust, BUAV and The World Wildlife Foundation. All packaging contains optimum levels of recycled materials and is recyclable.